Pat the turkey dry with paper towels. In a small bowl add the oil and combine with the Season All, pepper, onion and garlic powder. Add enough oil and soft butter to the spices to make a spreading consistency. Insert your hand between the skin and the breast to separate and create a pocket. Slide your hand under the skin and carefully lift the skin gently to avoid tearing. Slather the turkey inside and out and under the skin including the cavity with the oily-buttered mixture. Slide in any variation and as much of the slices of onions and the green peppers under the skin as you can without over stuffing. Any remaining vegetables, insert inside the chicken cavity.Or slather the turkey with only the oily-buttered mixture. 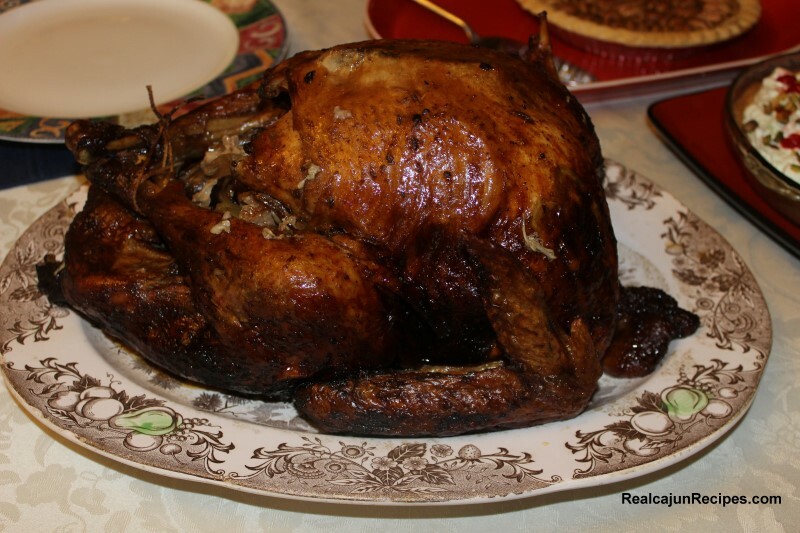 Place the turkey on a wire rack in a roasting pan. Combine the browning sauce and butter and baste the turkey with the butter mixture. Cook at 400 degrees for the first 30 minutes - Reduce heat to 325 degrees for the remainder time needed based on the weight of the turkey per the cooking and carving directions fact sheet packaged with the turkey . A general rule of thumb is to *Roast a 10 to 14 lb. turkey for 12 to 17 minutes per pound. *Roast a 14 to 20 lb. turkey for 13 to 18 minutes per pound. Do Not Peek. In the last 30 minutes of cooking, remove lid and baste with the turkey juices. The turkey is done when an instant-read thermometer inserted into the thickest part of the thigh (do not use drumstick and avoid bones) registers 180 degrees F and 170 in the breast and the juices run clear. Rest the turkey 15 to 30 minutes before carving.